Antarctica is a land full of wonder, beauty, excitement, purity, and adventure, as well as many other things. There really is no place like it on earth. The pristine, unadulterated environment sets Antarctica apart as one of the few world wonders left unscathed by man. Such a place calls the name of a select few - the curious, adventurous, wandering souls searching for the mysteries of science, beauty of nature, experience of a lifetime, and companionship of similar minds. Not unlike the locale in which it is set, the workplace in Antarctica is also like none other on earth. USAP employees and grantees come from all walks of life - all ages, educations, experience, and socioeconomic backgrounds represent the composition of the few, proud employees braving nature's harshest environment in the name of science. It is true that the ice gets in your blood, for it is here that you will experience the finest of what nature has to offer, the company of the greatest people you will ever meet, and the knowledge that you are supporting the advancement of our understanding of the world around us. On the ice you will forge	new experiences and relationships that will last more than a lifetime. A season on the ice is not easily forgotten, nor are the people you live, work, and play with each and every day. 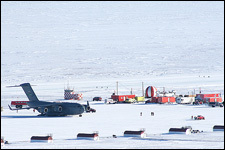 McMurdo Station is the logistics heart of the USAP's operations. As the gateway of Antarctica, McMurdo Station is the initial arrival point for multiple nation's research and support teams. Covering over one square mile, McMurdo Station is comprised of multiple structures strategically designed and arranged for minimal footprint and environmental impact. Structures include dormatories for employees and grantees, storage facilities for food and other station supplies, a power plant, waste water treatment plant, water de-salination plant, vehicle maintenance facility, various trade shops, the Crary Scientific Laboratory, a firehouse, medical center (McMurdo General), basketball gym, weight gym, aerobic gym, church, three bars, a multi-purpose facility (which includes a general store, full-service galley, dormatories, and offices), logistical operations center, NASA communications facility, fossil fuel storage structures, a green house, and many more. All structures are within walking distance of one another, allowing minimal time to be spent in the environment during harsh storms or temperatures. Three runways comprise McMurdo International Airport (lovingly abbreviated MIA), which is the largest and busiest airport on the continent. The Sea Ice Runway is built on the seasonal sea ice of McMurdo Sound each year and operates from September through November. The ice runway accomodates all types of aircraft, including the C-17, but weight capacity depends on the thickness of the seasonal sea ice. Williams Field begins operations in late November and continues through late Feburary, but only accomodates aircraft retro-fitted with ski-type landing gear (such as USAF LC-130s). Pegasus Ice Runway is capable of airfield operations year-round, though it is typically used December through March. Pegasus can accomodate all types of aircraft. There is no shortage of things to do for those stationed at McMurdo, as a plethora of recreation opportunities are available. McMurdo Station has recreation staff who plan everything from murder mystery nights to live entertainment by local talent, day trips, sports leagues, and more. Multiple hiking paths are available around McMurdo Station and Ross Island, and the station's three separate bars kick off the night life with live music or movie screenings. For those interested in personal fitness, fully-complemented aerobic and weight gyms are available 24/7, as well as a full-court gym for basketball, dodgeball, soccer, and volleyball. McMurdo Station is also home to an antique Brunswick	bowling alley, complete with hand-set pins and pin-striped-sock pinsetters. 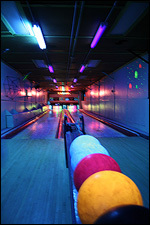 Cosmic bowling occurs regularly, and the alley is available for private parties. For those who would rather stay in for a night alone or with friends, the McMurdo General Store has a video/DVD collection available	for rental at no-charge (donations to the collection are welcome). If being the center of attention is more your style, then hop onto the airwaves of 104.5 Ice Radio - McMurdo's live radio station DJed soley by volunteers. In short, there's always something to do around Mac Town, and if you don't know of anything going on, just walk around and something will find you. The local wildlife tends to stop by from time to time. Whether it be the pesky Skuas, an Adelie penguin, or Weddell seal - it's just a matter of time before someone comes wandering by. Just be mindful of proximity and interaction with wildlife, as it is strictly goverened by Federal law. As was mentioned earlier, an eclectic mix makes up the population of USAP personnel, but as odd as some may be, these are the greatest people you will meet in your life. 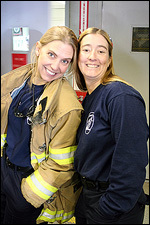 Everyone from the fire department to the scientists to those in charge of trash (wasties) loves their job, and enjoys every minute of their time on the ice. You will be hard-pressed to find someone who doesn't enjoy their work. This refreshing attitude fosters a low-stress working environment where everybody gets along. Sure, some have their differences, but at the end of the day they put them aside and enjoy a cold one together. Life-long friendships, and even serious relationshipsare formed on the ice. These are the bonds that trancend distance and time - the bonds you form few times throughout your life. Your experience on the ice will definitely change you, and when you move on to bigger and so-called "better" things, you will find that the ice has gotten into your blood, and your life has been affected - forever. Ready for the experience of a lifetime? Join the AFD in our support of science! Learn how to apply!